This pinwheel sandwich recipe is so easy! 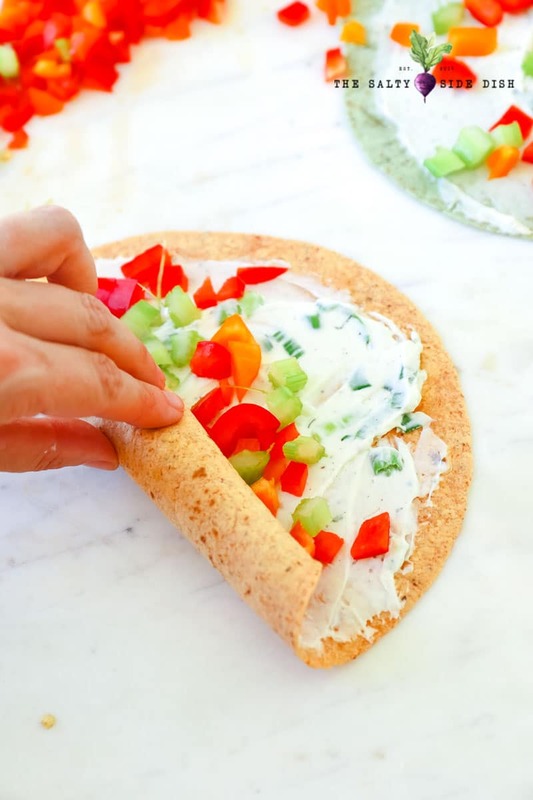 Cream cheese smothered in veggies inside tortilla wraps is a delicious finger food appetizer that will keep your party going. Pinwheel Sandwiches with Cream Cheese make an awesome party platter addition. So easy to make, with the flavors being easily adjustable to include ingredients you love, these are big game and holiday approved. I love sandwich wraps SO much for lunch. Typical bread always fills me up and quite honestly, is a bit boring. But whipping out the wraps gets my attention asap. This particular pinwheel sandwich recipe is great for a party appetizer, but its also a perfect finger food for kids as well. Need some more recipes to serve up that are perfect to grab and go? 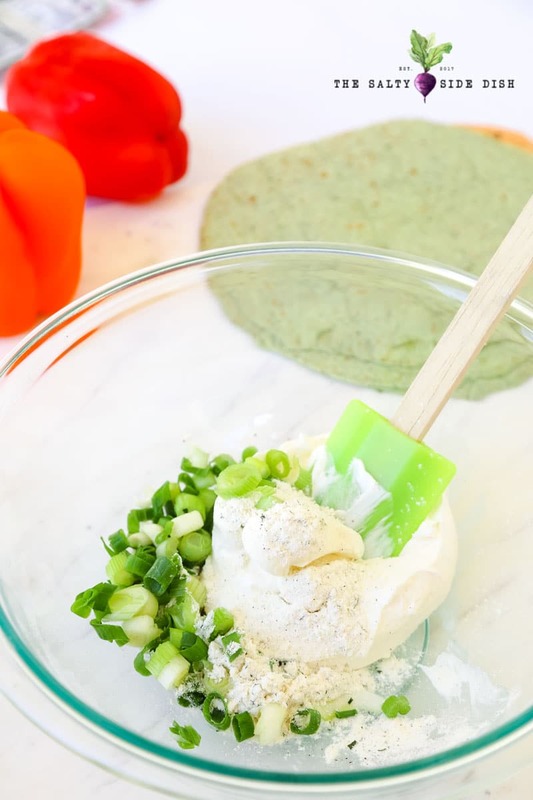 In a bowl combine your cream cheese, ranch package and diced/chopped green onions together and make sure it’s all mixed as evenly as possible. Cooks Note: If you prefer to have less thick center, you can easily use 1 package (8 oz) instead of 2. I’ve had it both ways and it both taste awesome so it’s more of a preference. 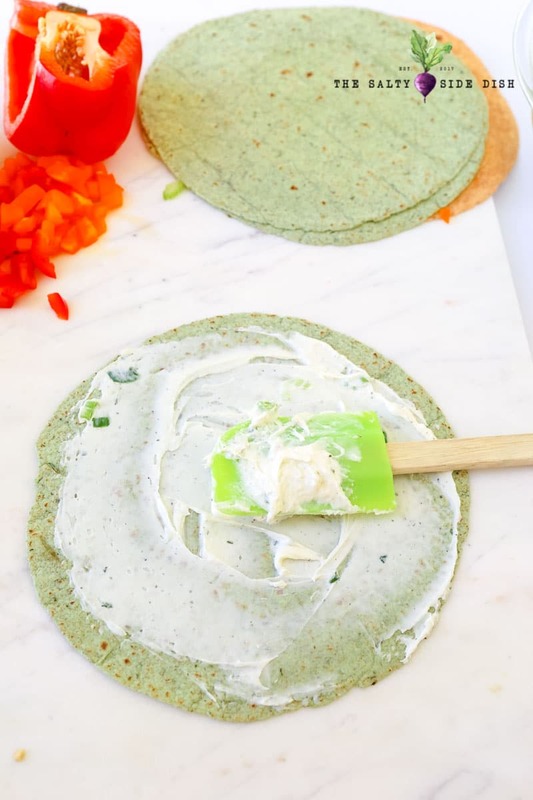 Lay out your tortillas and spread the cream cheese mixture evenly on the entire tortilla. Now sprinkle your diced veggies, making sure they don’t clump up in one area because it makes it harder to roll evenly. In the case of this recipe, I kept it super simple, but you can also layer on black olives, shredded cheese, or diced pickle as well. Personally in this flavoring I wouldn’t add ham, so I will address a better recipe for ham rollups in another post. 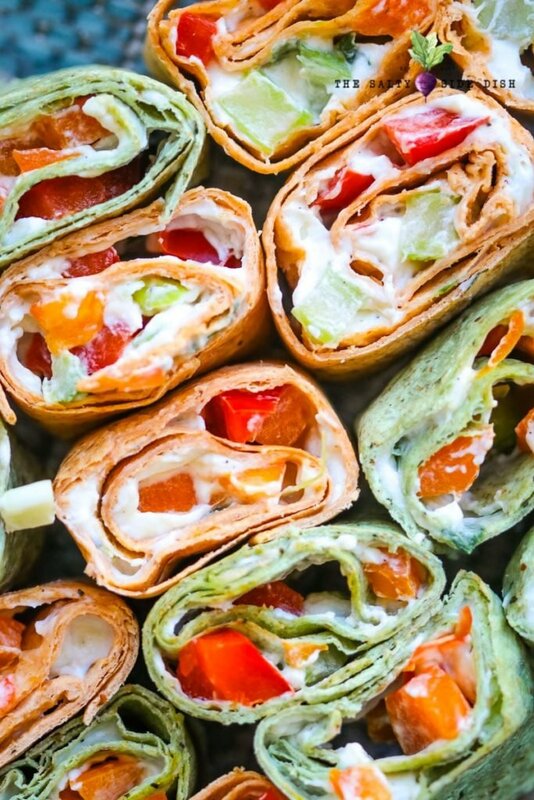 This recipe is more for vegetarian tortilla pinwheels. Slowly roll up your pinwheels tightly and evenly. Wrap them in plastic wrap or aluminum foil so they keep their shape and pop in the fridge for a minimum of 2-3 hours. They set even better overnight but if you are rushed for time, a few hours is plenty to get cold. Take out of fridge and trim edges. Now slice into 1-1.5 inch slices, which make a quick and easy appetizer that will be a big hit at your next party! 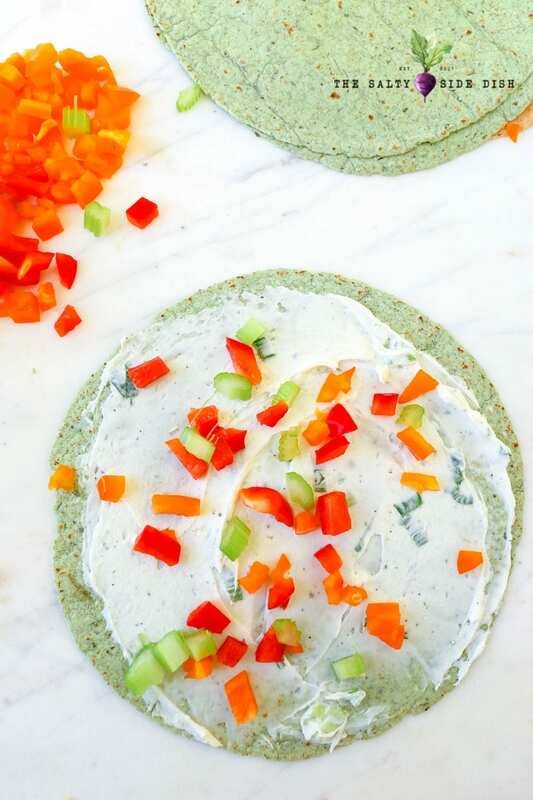 Pinwheel Sandwiches with Cream Cheese and diced veggies make an awesome party platter addition. 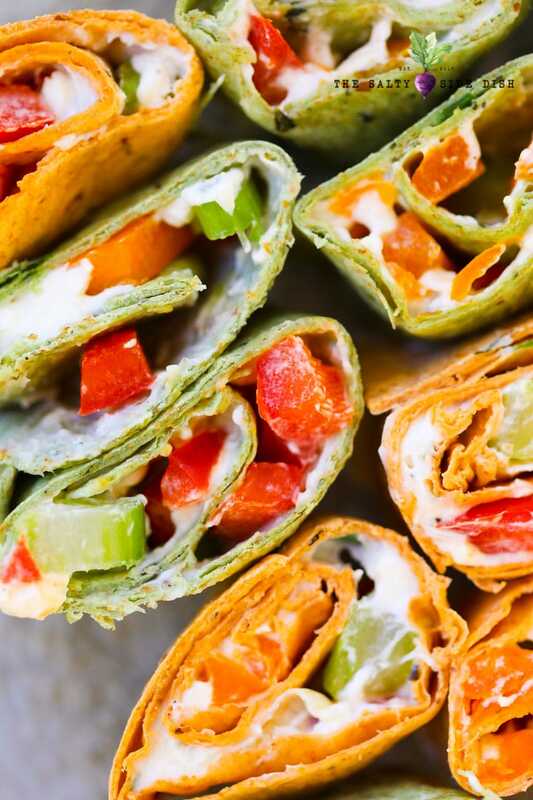 Easy to make, with the bold flavors being easily adjustable to include ingredients you love, these tortilla rollups are big game and holiday approved. Roll up tightly and secure with plastic wrap. Put in fridge for 2-3 hours until firm. Cut off ends and then cut tortillas into 1 inch slices. Serve cold. You can vary your ingredients for this recipe. Please see entire recipe layout for suggestions and alterations.